Mothers Fender Well Brush cleans wheel wells beneath the car's fenders. Fender Well Brush has a long handle to scrub behind wheels and tires. Don’t forget the wheel wells! Fender wells, wheel wells – whatever you call them, that space surrounding your tires gets filthy. Mothers Fender Well Brush has a long handle so you can clean where you wouldn’t dare put your wash mitt! Mothers Fender Well Brush has a non-slip rubber grip on the handle for maximum comfort and convenience while you scrub your vehicle’s dirtiest areas. The handle is angled away from the brush head so you achieve the best angle for scrubbing. The bristles are feathered yet very sturdy. They can easily dislodge caked mud and road grime that has slung off the tires and stuck to the wells. 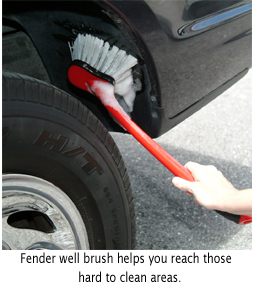 A rubber edge around the brush head prevents accidental bumps with the fender as you clean. Mothers Fender Well Brush also makes a great wheel and tire brush. The feathered bristles will not scratch coated or painted wheels. If you have coated wheels, its best to stick with a water-based wheel cleaner or one rated for all wheel types. To make your job even easier, use McKee's 37 Cleanse-All Exterior Cleaner. This intense cleaner tackles your vehicle’s worst areas and breaks up what other cleaners can’t touch. It is the best cleaner for wheel wells. A high-powered hose nozzle will also help you blast stubborn dirt and mud out of wheel wells. Set your Fire Hose Nozzle to jet and stand back! Clean up under the hood with Mothers Fender Well Brush. This durable brush can go anywhere! But once it does, keep it off your paint to avoid cross-contamination. Clean up down under with Mothers Fender Well Brush! My XK Jaguar has a felt-type lining on the fender wells that pick up tree needles and leaves during the fall season. Because of the width of the tires, it's impossible to get deep into the fender well to clean out the debris and this brush serves the purpose well. Does great job of getting to entire fender wells without the "busted knuckles"
As another reviewer stated, this brush works well as a wheel well cleaner on your SUV or truck but will not work on a low profile sedan nor sports car. It IS soft enough for the face of most wheels, so it still gets three stars. Would be nice if someone came out with a low profile wheel well brush. Don't expect to clean your wheel wells unless you own a truck, or at least 5 inch's space between your tires and fenders. Mothers could have designed this brush a lot better. If the handle would be flush with the base of the brush it would work with 90% of vehicles out there. However, with its current design you can only clean the face of your wheels and maybe 3 inch's of your liner because it wont fit any further on regular sedans. Great product and quality.. Gets the dirty work done and keeps your wash mit clean..